You should worry less with power point decks, pitches, or any of the usual prep. Your customers want YOU to be PRESENT. 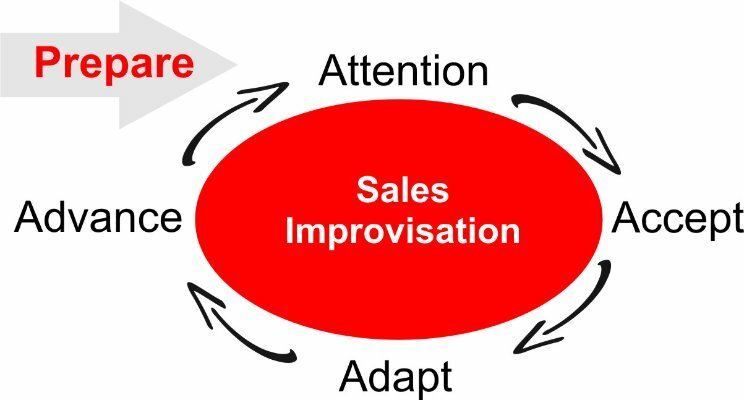 Improvisation skills are the key to wining in sales conversations. Entrepreneurs are constantly in the position of having to make things up on the fly. As a result there’s constant worry when things don’t go according to plan. What do you do then? Learn the skills of improvisation. At it’s foundation is the process of learning to be fully present. If you have ever seen Who’s Line Is It Anyway It’s a process you can learn. The main objective is to pay attention to everything that is happening. Then respond without thinking too much about what you are going to say. I get that it’s obvious that we all should do a better job listening. However, when you get into an improvisation workshop you come face to face with just how difficult it is to be fully present. In business, like on stage, we are always communicating with other people. In improvisation the actors are called players. As a collective group they are called an ensemble. Even if you are solo entrepreneur, your “ensemble/player” is your customer. Participants can feel the fear, trust their feet, and listen fully. It’s hard to let go of the control of not knowing what comes next or what to say. However there in lies the magic. You learn to truly listen to create something that was not possible before. Pay attention: Fully pay attention to what the other players are saying. Be present, and ready to bring solutions ALWAYS.